As such, this section of the book is an exploration of the tension between the careful planning and co-construction of the physical and the digital built environment (including electricity, projection areas, placement of buttons and handles, etc.) with the modifications that users do to the interactive textures of their surroundings. This last section of the book is inspired by the recent bottom-up approach to design that is significant for e.g. the Web 2.0 development and the “Lifehacking” phenomenon (see e.g. Bernstein, et. 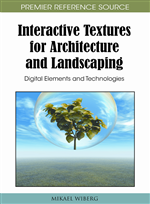 al., 2007), and in this last section of the book a discussion around IT – “beyond the box” is initiated as to address the hardest challenges related to this area, including issues of sustainability and how to work with innovations around new emerging interactive textures. In an attempt to take a truly fresh point of departure for one such discussion the whole notion of “the box” needs to be erased. Thus, the guiding theme for this fourth and final section of the book is titled “There is no box”. In the following two sections a traditional architectural perspective is applied to the current development of IT as to contextualize these technological developments even further in the context of architectural thinking. Then, this view is critically examined from a use perspective that is growing within the field of interaction design, i.e. the understanding of how people not only use digital technology in the form and in the shape it has from its design origin. Instead, people always try to adjust, change, modify and alter the technology either to fit some slightly different purposes, or just for the fun of turning it into something else. Sometimes this is described in terms of technology drift (e.g. Ciborra, et. al., 2000). In other more recent cases this has been described in terms of “lifehacking” (e.g. Bernstein, et. al., 2007). In a sense, these two blocks of sections in this chapter represent two different paradigms, i.e. an architectural paradigm, and a paradigm rooted in interaction design more closely related to what people do with their everyday digital technology. Still, in practice these two paradigms melt together and as it will be shown these two perspectives taken together work as a stable ground for understanding new digitalized environments. In chapter two when I started to look more specifically at textures and the mechanisms and operations around textures I focused heavily on representations. The book was in a sense guided by our understanding of digital “surfaces,” and to some extent I argued that we “read” textures in terms of surfaces. In the beginning of this book we also looked at how textures related to materials similar to how representations relate to sets of information. This was an understanding of textures at the level of the artifact, the object, and the architectural element.